The exercises at this site supplement your textbook. Work through the punctuation and grammar exercises first and then work on writing style. The more you practice, the stronger your skills will become. However, the most important step is applying the principles that you are learning to your own writing. To purchase this book, contact us. Clear and effective writing is an essential communication skill for social workers. We often share our practice experiences with other professionals through publishing our research, submitting reports to supervisors, judges and doctors, and documenting the experiences of our clients. When a research article or a court report demonstrates critical thinking and is clear, concise, and accurate the reader is more likely to consider the outcomes and recommendations. As a result, our writing impacts countless lives. Writing is not a gift but a skill that is developed with effort over time. Some people write well because they learned from early training. Others develop those skills later in life. The writing courses required for social work education can help build those skills. Writing, critical thinking, and research are essential skills in the profession. The Council on Social Work Education (CSWE), which accredits social work programs, has identified several core competencies that support the use of effective writing. The first core competency is that students will “identify as a professional social worker and conduct [themselves] accordingly” (2.1.1), including demonstrating “professional demeanor in behavior, appearance, and communication” (CSWE, 2010, p. 3). Communication includes spoken and written communiqués. The ability to write is a necessary skill and part of our professional identity as social workers. This competency clearly identifies the importance of written communication in all aspects of service provision. Academic research leads to evidence-based practice, which is crucial for effective social services. The sixth CSWE core competency directly relates to research. How do we find, understand, and evaluate the evidence that does or does not support a particular policy or treatment approach? This competency states that students will “[e]ngage in research-informed practice and practice-informed research (2.1.6)” including the use of “practice experience to inform scientific inquiry [and] . . . research evidence to inform practice (CSWE, 2010, p. 5). Academic and professional writing requires an effective argument supported by evidence and explaining counter-arguments. Practitioners must be able to explain to clients and supervisors the reasons one strategy or approach is encouraged over another. Research can support these recommendations and further our ability to be effective practitioners. However, literature reviews demonstrate gaps in the research, and these need to be filled by social work practitioners. The only way social work practitioners will be considered credible by scholarly journals is by conducting ethical research, guided by sound research principles. There are many important discoveries in the field that must be reported through clear scholarly writing. This text will guide you through the principles of scholarly and professional writing. Remember, no one starts out being able to write well. Many students struggle to develop writing skills just as they struggle with other skills, such as learning math or using a computer effectively. Do not let your struggles hold you back. Writing is a skill that can be learned and developed, and writing skills are essential to the social work professional. As you go through your academic and professional career, you must adapt each piece of your writing for your audience. One aim of this textbook is to assist you in developing your voice—or rather, your various voices. For example, for academic papers, your audience expects a formal style, and that style may include passive voice; in contrast, for your daily professional writing, such as e-mail messages and letters to clients, a less formal, direct style of writing is more effective. An element of voice is formatting: formatting speaks to your audience at a glance. Each document that you produce, from a simple e-mail message to an academic paper, must be formatted according to guidelines and protocol. Only by developing expert formatting skills will you be able to adapt each piece of your writing for purpose and audience. Since your academic papers in social work are formatted in the American Psychological Association (APA) style, Chapter 6, “APA Citation Style,” provides information to get you started formatting papers in APA style. (Also note that references at the end of each chapter of this book are formatted in APA citation style.) Moreover, Chapter 18, “Formatting” gives you additional details about APA formatting as well as the guidelines that you need to produce professional letters, memos, and e-mail messages. The Writer’s Handbook: A Guide for Social Workers first gives you an overview of the kind of writing that you will do in your field. Then the remainder of the book focuses on principles that lead to correct and credible writing. Part 1, Academic and Professional Writing, examines the qualities of academic writing as well as the expectations of professional writing in the field. In Chapter 2, you become familiar with forms used in the day-to-day operations of social work, preparing you to document your practice. Chapters 3 and 4 provide the basics of how to evaluate, conduct, and present research, including a literature review. Chapter 5 gives insight into critical thinking; chapter 6 covers APA citation style, the required style of documentation in your chosen profession. Part 2, Process and Structure, reviews core principles for composing and revising. Chapter 7 covers the writing process; chapter 8, the sentence core; and chapter 9, cohesive, coherent paragraphs. Part 3, Mechanics of Writing, presents comma and semicolon rules, taking the guessing out of punctuating and reinforcing the sentence core. Part 4, Grammar for Writing, covers core elements of structure such as verbs, pronouns, and modifiers. Part 5, Editing for Clarity, presents principles that lead to a clear and concise writing style. Part 6, More Mechanics, provides correct use of the minor marks of punctuation as well as capitalization and number usage. Finally, the Quick Guide for Job Search Tools gives a step-by-step process so that you can prepare your career portfolio. Each chapter builds on the previous, so do not take any shortcuts. By learning foundational principles first, complex topics become easy. This book applies the method of principle and practice: As you learn each principle, practice it until you integrate it into your writing. Compose freely and then edit ruthlessly. By working through each chapter and doing the activities as prescribed, you build your skills, filling knowledge gaps that may keep you from doing your best. To give yourself immediate reinforcement for practice on exercises, refer to Keys to Activities located at the back of the book. For additional practice, visit the book’s website at www.thewriterstoolkit.com. Learning involves change, and change is challenging, even painful at times. Commit yourself to the learning process as well as the writing process, and you will become an expert editor. Do the work, and you will see the results! Good luck on your journey. The Writer’s Handbook: A Guide for Social Workers is designed to prepare social work professionals for all types of writing required in their field. In addition to social work content, The Writer’s Handbook covers essential writing topics in a user-friendly format: principles are sequenced from the simple to the complex, using a narrative style to engage learners. While writing is a core activity in all professions, in the field of social work correct and credible writing is critical: at times, people’s lives depend on it. Therefore, even those who are challenged by writing must become proficient writers to be effective in the field. A traditional approach to improving writing skills has been to work with learners individually, giving feedback and coaching. Though time-consuming, this approach is powerful; however, significant accountability seems to remain in the hands of the instructor rather than in the hands of the learner. Present chapters in workshop format. Encourage learners to work on learning activities on their own or with a peer, using the keys at the back of the book or completing the practice exercises at the book’s website, www.thewriterstoolkit.com. The Writer’s Handbook charts an instructional design that is in tune with the taxonomy of educational objectives. As a result, learners readily fill knowledge gaps that may have been hindering their progress. For example, the taxonomy reveals why learners have a more difficult time with higher-order principles of writing (such as analysis and synthesis) when they do not first understand lower-order principles (such as summarization). The taxonomy also gives insight into how a graduate student can write an insightful analysis of a complex theory but still have difficulty with run-on sentences or subject-verb agreement. The Writer’s Handbook: A Guide for Social Workers aims to provide writers at all levels the tools that they need to succeed in their academic studies as well as their professional careers. Part 1, Academic and Professional Writing, sets the tone by giving learners a clear understanding of the types of writing and the quality that is expected in the field of social work. Part 2, Process and Structure, provides a foundation for composing and editing, from controlling the sentence core to developing cohesive paragraphs. Part 3, Mechanics of Writing, teaches commas and semicolons while further reinforcing the sentence core, ensuring that fragments and run-ons are no longer issues. Part 4, Grammar for Writing, fills knowledge gaps, giving learners insights into their own language patterns and control over them. Part 5, Editing for Clarity, reinforces expert editing skills by having learners apply active voice and parallel structure. Students also learn how to format business documents such as letters, memos, and reports. Part 6, More Mechanics, covers the fine details of editing, such as word usage, colons, apostrophes, capitalization, number usage, and so on. 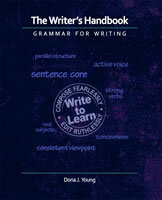 The Writer’s Handbook also provides instructors and learners with a common vocabulary for punctuation. This approach makes it easier to learn the rules and to provide feedback efficiently. The methodology integrates principles of structure with principles of style so that a learner’s writing becomes clear and concise as well as correct. Experiment using individual chapters as workshops or use them for activity-based learning. If your students need additional practice, have them visit the website, www.thewriterstoolkit.com, for a full range of interactive activities. To contact me for additional assessments and other supplemental materials, go to www.youngcommunication.com, where you will find a contact form. I look forward to hearing your feedback and suggestions. The Writer’s Handbook: A Guide for Social Workers aims to assist writers at all levels build their skills so that they produce correct, clear, and concise writing. Those aims align naturally with the American Psychological Association (APA) guidelines for writing. Therefore, principles presented in the book’s chapters on grammar, punctuation, style, and tone all support guidelines presented in the Publication Manual of the American Psychological Association. Chapter 4, Literature Review, walks learners through a step-by-step process to write a literature review, providing an example of a student’s paper formatted in APA style. Chapter 6, APA Citation Style, covers basic elements of the style, giving learners another example of APA formatting in which the elements of APA citation style are discussed and illustrated. Chapter 18, Formatting, includes information about APA formatting that writers struggle with, such as setting paragraph controls and creating a running head. In addition, this chapter provides support in creating other professionally written communications, such as e-mail and business letters. Chapter 21, Capitalization and Number Usage, reviews the differences between title case and sentence case as well as provides basic points about how to display numbers in APA documents. The student website, www.thewriterstoolkit.com, provides additional resources. In addition to basics of APA style, this book aims to assist writers in improving their writing skills in a full spectrum of professional documents, including case documentation as well as daily writing activities, such as e-mail. By improving their writing skills as well as becoming well versed in various styles of formatting, social work graduates will enter the field well equipped for any kind of writing. In fact, social workers rank at the top of professions in which correct and credible writing is critical. Their clients’ lives depend on it. When a case goes to court, a judge depends on documentation the social worker provides so that a fair decision can be made. Many books and websites are dedicated to APA style, some of which are published by the American Psychological Association. This book recommends that writers use those primary sources as their ultimate guide for making decisions about details in APA style and formatting. Communicating effectively online is a critical element of most professions today, and online classes give you an exceptional opportunity to hone your skills to prepare for your career. The following information gives you a general idea of how to participate in online classes. Experiment by navigating to each of the tabs that your instructor has included for your class. Many online classes work in teams, and an important component of online classes is forum discussions. In forums, students post responses to questions and develop dialogues with their teammates. By clicking on the tab marked Forums, you will see the current forums that your instructor has posted. Each week or so, your instructor will add new forums for your class. If a forum is locked, it means that your instructor has not yet opened that forum for your class, or the forum is completed and thus closed. In general, forum consists of two types of activities: substantial postings and discussion responses. A substantial posting is a response to a forum question in which the writer starts a new thread for the posting. A discussion response is a comment in response to a substantial posting. For each forum, read the full description by clicking on View Full Description so that you clearly understand how to compose your substantial response. Your teammates or classmates will post discussion responses so that together you can develop a dialogue about the topic in that forum. For substantial postings, summarize key points from your readings. For all postings, use your own words, sharing your insights and giving examples about how you are applying new principles. In other words, do not paraphrase from your readings. By summarizing your own understanding, you are learning principles as well as reinforcing your teammates’ understanding of the readings. Learning online is a team effort, and when all team members participate fully, the outcomes are outstanding. What is an effective substantial posting? To write a substantial response, summarize principles from your readings along with your insights and how you are applying what you are learning. Your teammates will respond to your posting by validating your points and adding new information. Chapter 1 covered principles about academic writing, which is also known as scholastic writing because of the stringent requirements for using research effectively and writing in the correct style. For example, in the field of social work, writers must use the American Psychological Association (APA) citation style. Also, when referring to an author, use the author’s last name. Never refer to an author by only his or her first name. Before reading the next example, use the PEER model to analyze the above: can you find key points, facts, details, or examples? I liked reading the chapter about academic writing because I learned a lot about how to write a paper, which can really be hard at times. Academic writing is important because that’s the kind of writing that is expected in our classes, but I’ve never been really good at writing papers but now I feel more confident. Can you see the difference between the two postings? In the first example, the writer explains a key principle. In the second posting, the writer does not tie his or her experience to a principle from the chapter. Substantial postings are generally two to three paragraphs or longer. Effective substantial postings spark a discussion among teammates. What is an effective dialogue posting or response? As you respond to your teammates, validate points that resonate with your own experience. Add new information to extend the reader’s knowledge, and share how you are applying what you are learning. Support the learning environment by giving feedback without being critical. Be accepting and forgiving, and your teammates will respond in kind. Even after reading the above, you may still be confused about what a forum is. Your instructor understands that you may feel confused and will patiently guide you through the process. Do your part by reading course materials and thinking things through. Any new experience is difficult in the beginning—that is why you need to give your best until you understand what is expected. It may take as long as a week to feel comfortable at your class site: every time that you go back, you will feel more confident. The following is an example of a forum. Instructions: In this forum, you will get to know your classmates. Since supporting social and economic justice is an essential aspect of social work, in your response include information about an issue you advocate. Share general background information about yourself—what things would you like for us to know about you? What areas of social work practice interest you and why? What is an issue that you want to advocate for or against? Please explain the issue and describe how you might do this. In some ways, interacting on the Internet is different from interacting in person; however, all communication has some elements in common. How can we co-create a respectful and productive learning environment in class and online? What can classmates do to help you feel safe to express yourself? What can you do to provide feedback in a supportive and respectful way? What can classmates do to help you hear and understand their feedback? If you were to write a list of rules for online etiquette, or “netiquette,” what would be some of your rules? Finally, describe three ways to have a discussion online that enable members of the discussion to disagree respectfully. In each forum, for your substantial response, start a new thread. Please post one paragraph for each topic. Once you have posted your forum, respond to other postings. Though e-communication is different from face-to-face communication, keep the human elements of communication in mind: your online class is an interactive process among people who have feelings and expectations. Communication is about building relationships based on trust and respect. Stay in tune with your teammates’ and professor’s expectations by respecting ground rules and following best practices. Manage deadlines by setting internal due dates in advance of the deadlines your professor establishes. To support the context of building relationships based on trust and respect, here are some best practices for online classes. For all e-mail messages, use a salutation that includes the recipient’s name; also include a closing. Always follow standard rules of grammar, punctuation, spelling, and capitalization. Avoid using abbreviations and never use text message language in e-mail messages. When you reply to a message, do not delete the thread. By leaving the history, your reader understands the context in which to reply to your message. Update the subject line so that the recipient can file your message effectively. When you send assignments as e-mail attachments, label your work correctly. Respect all due dates: if you are not able to meet a due date, ask in advance for an extension. Before you ask for help, read your syllabus, reading schedule, assignments, e-mail messages, and forum descriptions two or three times. Read forum instructions before you read an assigned chapter. Then read the chapter thoroughly, highlighting key points, taking notes, and jotting down your insights. Proofread and edit your writing carefully before you post. Proofread and edit your writing carefully again after you post. Work independently: try to figure things out on your own before asking questions. This approach prepares you for what will be expected in your profession. Build your expertise in formatting; review Chapter 18, “Formatting” early on, paying special attention to setting paragraph controls and learning spacing guidelines. Save and file all class communications; keep track of all of your assignments and grades. Finally, keep human elements of online communication alive by respecting your classmates and professor: following protocol is one way to show respect. Know best practices and follow them. Use salutations and closings when you write an e-mail. Never use text message language. Try to figure things out before you ask for help. Post in advance of due dates. Become confident in your ability to communicate effectively—the more you put into class, the more value you gain. Use The Writer’s Handbook: 12 Workshops for Effective Writing as a supplement to The Writer’s Handbook: A Guide for Social Workers: Together they provide an excellent foundation for a writing class dedicated to social work majors. For those professors who have adopted the workbook for a class, contact us for the teacher’s manual. As a supplement to The Writer’s Handbook, this book presents 12 workshops that develop editing skills needed to produce effective writing. Each workshop can be completed in about an hour. The workshops are sequenced so that one concept leads to the next, simplifying the learning process. The workshops are designed to present a minimum of theory followed by practice. 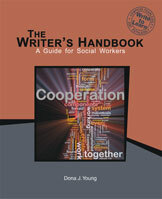 For more detailed explanations, refer to The Writer’s Handbook: A Guide for Social Workers. The first step is gaining control of the writing process. Once you compose as a separate activity from editing, you are ready to build editing skills step by step. This first step is critical to the entire process. The next step is working on the mechanics of writing. Punctuation is the key to effective editing because you focus on the sentence core: the most basic and powerful unit of editing. Though you can work on your own, you gain more value by working with a partner or in a small group. By discussing principles, you are more likely to apply them. Once you can compose freely, each editing principle that you apply improves your results. By gaining control of the sentence core, you gain control of the quality of your writing. By working in teams, you view solutions from several different perspectives, gaining insight and learning principles at a deeper level. Principles of one topic are linked to principles of another topic—that is why it sometimes feels difficult to make progress. This book helps you focus on the sentence core so that you readily learn to make decisions that lead to accurate, clear, and concise writing. As you learn each new principle, your editing skills improve and, thus, the quality of your writing improves. These workshops organize essential topics to expedite learning so that you develop proficiency. This approach simplifies the learning process, but your ultimate challenge is to apply what you are learning in your own writing. Only you can do that. Writing depends on structure for sense and credibility and, at the same time, structure can interfere with writing. For example, when you stop composing to struggle over correct grammar or punctuation, you do so at the expense of losing your ideas. Writing involves critical thinking, bringing higher levels of understanding to unique topics or problems. In contrast, structure is about syntax: how words string together for different effects. Structure, for the most part, involves applying finite rules; in contrast, writing entails creativity, curiosity, and inquiry. Writing is a complex problem-solving activity, and learning about structure adds another layer of complicated information to an already challenging pursuit. That is because elements of structure are linked: to understand one principle, you must also understand a myriad of other concepts, making it easy to become confused. So why even discuss structure? One reason is that using correct and effective structure adds clarity and credibility to writing. Another is that as you mull over your words to string together in more effective ways, you are likely to gain more insight into your topic. The Writer's Handbook simplifies essential topics and orders them so that one concept builds to the next. Complex principles become easier to understand because you review foundational principles first. The Writer's Handbook takes you step by step on a path that leads to correct, clear, and concise writing. As you learn each new principle, your editing and revising skills will improve, and thus the quality of your writing will also improve—as long as you apply what you are learning. By the time that you finish this book, you will have significantly improved your writing skills—or more specifically, your revising and editing skills. Good luck on your journey, and remember that practice makes progress: Now go for it! The Writer's Handbook untangles structure, easing you into complex concepts by first covering foundational principles. This book applies the method of principle and practice: as you learn each principle, practice it until you integrate it into your writing. Part 1, Foundations, reviews core principles for writing and revising. In Chapter 1, you learn about the writing process; in Chapter 2, you review the sentence core; and in Chapter 3, you learn how to structure cohesive, coherent paragraphs. The sentence core is where structure and writing cross paths: controlling the sentence core is key to producing correct and reader-friendly sentences. Once you understand the sentence core, issues of style such as using the active voice, applying parallel structure, and being concise become easy. Part 2, The Mechanics of Writing, presents comma and semicolon rules, taking the guessing out of punctuating and reinforcing the sentence core. Part 3, Grammar for Writing, covers the basics of verbs, pronouns, and modifiers, other core elements of structure. Part 4, Editing for Clarity, presents principles that lead to a clear and concise writing style. Once you start working on Part 3, Grammar for Writing, this book helps you identify the difference between local language patterns and Standard English (also referred to as Edited English). As you may know, everyone speaks a local language to one degree or another. In fact, no geographical location exists in the United States (or anywhere in the world, for that matter) where Standard English is spoken "purely." In every location, people have their own particular way of using English that varies slightly in terms of grammar, word usage, and pronunciation. Since no one speaks or writes English perfectly, perfection is not your goal. Instead, focus on improving your skills until you become competent and confident; you then have more options for how you use language in formal situations. 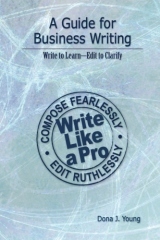 This book helps you improve your writing skills because it helps you become an expert editor. Start the process by taking the pretest at the end of Chapter 1. Your score will give you a starting point from which you can gauge your current skills and track your development. Work through each chapter and do the activities as prescribed. To give yourself immediate reinforcement for your practice, refer to the keys to the exercises. You will find the keys to the practice exercises, the skills workshops, and the editing workshops at the back of the book in Keys to Activities, starting on page 345. 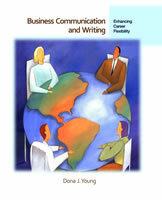 Visit the book's Web site at www.youngcommunication.com for additional practice on the topics presented in this book and more. Learning involves change, and change is challenging, even painful at times. That is why you must commit yourself to the learning process as well as the writing process. If you commit yourself, you will become an expert editor by the time that you finish this book. In fact, you may even become an incurable editor! Good luck on your journey. 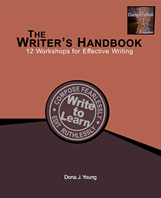 The Writer's Handbook is a supplemental handbook for any class that requires writing. The Writer's Handbook covers similar content as other handbooks while sequencing principles from the simple to the complex and using a narrative style to engage learners. Writing is a core activity in education as well as the professions. Even those who are challenged by writing must learn to write effectively or be seriously limited in their career options. Professionals in all fields communicate in writing: e-communication has sealed the importance of writing—if not for eternity, at least for the present. A traditional approach to improving writing skills has been to work with learners individually, giving them feedback and coaching. This approach is powerful, yet it also consumes time while keeping significant accountability in the hands of the teacher rather than in the hands of the learner. Encourage learners to work on learning activities on their own or with a peer, using the keys at the back of the book or the practice exercises at the book's Web site, www.youngcommunication.com. The Writer's Handbook charts an instructional design that is in tune with the Taxonomy of Educational Objectives. As a result, learners readily fill knowledge gaps that may have gone undiagnosed. For example, the Taxonomy reveals why learners have a more difficult time with higher-order principles of writing if they do not first understand lower-order principles. The Taxonomy also gives insight into how a graduate student can write an insightful analysis of a complex theory but still have difficulty with run-on sentences or subject-verb agreement. Once learners understand the sentence core, they are on the path to understanding structure. Sentence fragments and run-ons are no longer mysteries, and advanced principles such as parallel structure and consistent viewpoint become easily achievable. Even the graduate student who analyzes complex theories gains more credibility by presenting ideas in a style that is engaging as well as correct. The Writer's Handbook also provides teachers and learners with a common vocabulary for punctuation. This approach makes it easier to learn the rules and to provide feedback efficiently. The methodology also integrates principles of structure with principles of style so that a learner's writing becomes clear and concise as well as correct. Experiment using individual chapters as workshops; or instead, incorporate more activity-based learning by having learners read a chapter and then teach the principles to each other in small groups. Have your students take the pretest at the end of Chapter 1. For additional pre- and posttests as well as other supplemental materials, please contact me at www.youngcommunication.com. I look forward also look forward to hearing your feedback and suggestions. Orientation and Assessment. The text takes a diagnostic approach by pro-viding pretests that give you a realistic picture of your skills and learning gaps. After you complete the assessments, your skill profile will reveal the areas of grammar, punctuation, word usage, and writing style that you need to work on. The Orientation and Assessment is located on pages ix through xvi. The Writer’s Handbook Quick Guides. The Quick Guides are located at the last section of this text and are tied to skill development. The Quick Guides introduce you to The Writer’s Handbook, which is a separate text that walks you step by step through an effective process to improve grammar and punctuation skills as well as improve writing style. Without expertise in these areas, business writers can lose credibility. The Quick Guides are designed for you to use individually, as part of a team, or in whole-class instruction. Parts 1 and 2 contain materials to assist you with developmental gaps in punctuation and grammar. Parts 3 and 4 deal with formatting business messages and conducting research. By fully developing these topics and more, The Writer’s Handbook is an important supplement to Business Communications and Writing . To support learners in overcoming their learning gaps, The Writer’s Handbook includes numerous exercises along with keys, functioning as both a learning tool and a reference guide. Methodology. You will learn to make editing decisions based on structure, first at the sentence level and then at the paragraph level. Unit 1 of the text focuses on structure not on content. After you have developed an editing strategy, you will move from simple pieces to more complex activities. Units 2 and 3 of the text relate to composing, editing, and revising business correspondence, reports, presentations, proposals, and research projects (including newsletters and Web sites), among other applications. Coaching Tips. Throughout the text, you will find coaching tips that offer guidance to assist your understanding of topics. One of the premises of this text is that you will feel more freedom to write by becoming competent with mechanics (grammar and punctuation) and then syntax (active voice, parallel structure, removing redundancy, and information flow). Decisions about style are easier when you can understand and manipulate core sentence elements. Then, after you are proficient with structure and style, you will be ready to compose, edit, and revise effective business documents. Learning is a process, and you are encouraged to use mistakes as learning opportunities rather than moments of failure. In the first chapter, you may be asked to write about your past experiences with writing. Once you understand that writing is difficult for everyone at times, you may no longer feel isolated in your mistakes or fears about writing. You also have access to various types of resources and instructional assistance online at the Web site, www.youngcommunication.com. Thank you for giving this class your best and for using this text to its max. Set your goals high, and you will achieve career success. To tailor learning for classes that have an online component, the last activity in each chapter is devoted to online learning. Regardless of whether your class meets on site or online, communicating online will be an important element of your class and your career. Thus, let’s take a look at what online learning entails. In a forum discussion, you will respond to questions and discuss what you are learning with your teammates. When you participate in forum, include key points from the chapter so that your teammates can learn from your posting. Share your insights about what you are learning and how you will apply it. What is an effective substantial response? To compose a substantial response, summarize key principles from the chapter along with your insights and how you are applying what you are learning. Your teammates will respond to your posting by validating your points and adding new information. Chapter 1 covered principles in effective communication. An important part communicating is listening, which is something that’s hard for me to do effectively. For example, I always start to think about a response before the other person is even finish talking. To be a good listener, I need to learn how to become actively engaged in what the other person is saying. One technique that can help is mirroring. Mirroring is when . . . . I liked reading the chapter because I learned a lot about communication, which can really be hard at times. Communication is important, but I’ve never been a very good communicator and need all the help I can get. I’ve noticed other people aren’t good at communicating either. Can you see the difference between the two postings? In the first example, the writer shares his or her experience and then begins to explain a key principle. In the second posting, the writer does not tie his or her experience to a principle from the chapter. What is an effective dialogue posting? As you respond to your teammates, validate points that resonate with your own experience. Add new information from the chapter to extend the reader’s knowledge. Share how you are applying what you are learning. Communication is about building relationships based on trust and respect. Though electronic communication is different from face-to-face communication, you achieve the best results when you keep the human elements of communication in mind. By respecting your readers, you will achieve success in professional environments. In other words, your class is an interactive process among people, not simply computer screens. Upgrade the subject line so that the recipient can file your message effectively. Send assignments as e-mail attachments. Each week, post a substantial response to the forum question. Respond to your teammates’ in their forums by validating one of their key points and adding one of your own. Understand that the more you participate, the more value you will achieve. As a result, minimum standards are not spelled out in numbers. Think of an online class as a part-time job in which you have leadership responsibilities—try to figure things out on your own before asking for help. Your questions are welcome, but read your syllabus, reading schedule, assignments, e-mail messages, and forum descriptions before you seek outside assistance. Forum: What’s difficult about writing? Everyone has challenges with writing. The first step in improving any skill is to get a realistic understanding of what works and what doesn’t work. Description: This is your chance to be honest and “say it like it is” when it comes to writing—what’s difficult about writing for you? Get to know your classmates by sharing some information about your background, interests, and goals. Instructions: Tell us about yourself. When you post your response, you will be expected to start a new thread and post a substantial response. Read all instructions two or three times so that you understand exactly what is expected. Work independently—try to figure things out on your own before asking questions. This is good preparation for what will be expected of you on the job. Adapt to what is expected: start using salutations and closings when you write an e-mail, label your assignments correctly, and so on. Read the assigned chapter before doing the weekly assignment. Each chapter contains valuable information for doing the assignment correctly. Become confident in your ability to communicate effectively—the more you put into class, the more value you will gain. This book is for those who need to write effectively to survive on the job or pursue higher education. Though writing is an art, editing is a science. Effective editing takes the mystery out of how to produce clear, correct, credible writing. Each time that you apply a proven editing principle, you will see results. As you develop expert editing skills, you also gain more insight into how to use writing to build strong client relationships. A Guide for Business Writing starts with the simple elements of writing. By revisiting core principles, you are able to fill learning gaps that now hinder your progress. Trust the process: to transform your writing, focus on the simple, not the complex. This book walks you step by step through a process, giving you all the tools you need to succeed. If you now make writing decisions on the basis of guesses rather than educated choices, you are cheating yourself. For example, one of the biggest myths of writing is that commas are placed on the basis of pauses. When you find a pause, how do you know whether to place a comma, a semicolon, or a period at the break? In fact, how do you know that you are even pausing at a grammatical break? In about an hour or two, you can learn how to punctuate correctly, saving yourself time and frustration from that point on. As you learn how to punctuate correctly, you gain a sense of structure, with natural breaks in grammar becoming apparent. As you develop a sense of structure, principles of editing, such as active voice and conciseness, become easy to apply. No magic bullet exists; but if you do the work, you will see results. Spend an hour or less on each chapter, and the world of editing will open for you: you will gain a new lease on writing and the potential it offers your life and career. Before you start the first chapter, complete the pre-assessment. The pre-assessment is on pages xi through xvi. Feel free to copy the assessment. Your score will indicate your current skill level, revealing your learning gaps. When you complete the book, take the post-assessment and compare your results. Complete the brief exercises interspersed throughout each chapter. The Practice exercises give you an opportunity to apply new principles. The keys are located at the back of the book. Do the Writing Workshop and Editing Workshop exercises. At the end of each chapter, the Writing Workshop gives you a reflective topic for journaling. The Editing Workshop gives you drafts and revisions: work on drafts before reviewing the revisions. Apply the principles in your own writing. Learning involves change: give yourself time to improve. In general, it takes about a week to become comfortable applying a new principle. When you do not apply what you are learning, the knowledge quickly becomes lost: if you don't use it, you lose it. If writing has always been a challenge, give this method a chance—the way the topics are sequenced support you in your success. Thousands of business professionals have improved their writing skills using this approach. In some ways, the plan is foolproof, so do not second-guess yourself or cut corners. For a quick review, see the abridged version of this book, Eleven Steps to Instantly Improve Your Writing . Good luck on your journey: practice makes progress—repetition is key to improving any skill. You may find that building editing skills turns you into the writer that you have always wanted to be. In the process, you may also become an incurable editor. Do the work, and you will see the results—go for it! At one time, writing was an excruciatingly painful experience for me. That's because I would try to edit my words while they were still in my head. I also thought that when I sat down to write, I should have the answers. I did not understand that writing itself was a problem-solving activity, a discovery process. When my teacher Dr. Ralph W. Tyler told me that he spent part of every day writing himself clear-headed, I listened. He also said, "The house you live in is your mind, your own integrity—don't worry about the rest." The more I wrote, the more I was able to write. Writing helped me learn what I needed to know. You see, the way to learn about a topic, even if it is your own life, is to write about it. As John Dewey once said, "You become what you learn." Writing was not enough, though. Once my words were on the page, I had no clue how to edit or revise them. I felt like a "broken record" and based my decisions on guesses; this approach was frustrating and made me want to give up. So I took classes and read books and learned to edit; I also taught others what I was learning, and they in turn taught me: my best teachers have always been my students. In time, I realized that learning how to edit was the key that unlocked my ability to write. Editing allowed me to push the pause button between my thinking and my writing. Editing kept me engaged with my topic in a different way from the way writing did. With each edit, I reached a deeper understanding and expressed myself with more clarity. Writing, or composing, is a reflective process but one that is highly focused: when you stop to think about what you are writing, you lose your thoughts. In contrast, editing gives you tools to work with your words in slow motion, allowing you to revisit your ideas to refine and clarify them. To those of you who think that you are not writers, know that writing is a gift available to all who beckon its call; and learning to edit effectively will give you access to writing in a fresh and exciting way. To those of you who think that building your editing skills will not improve your critical thinking skills, keep an open mind. You do not need to be a creative writer to reap the benefits of writing, which are intellectual, emotional, and spiritual. As you write, if you listen closely enough, you will hear a still, small voice that will lead you to the answers that you seek. Writing makes it easier to hear that still, small voice because writing, similar to reading, is a meditation. When you can take the words that are in your head and put them on the page, you will have begun to liberate yourself from whatever is holding you back. Writing will help you find the truth, writing will help you find hope, and writing will even help you find yourself. My teachers, my students, my friends, and my family have all helped me on this journey. Thank you. Write to learn—edit to clarify.